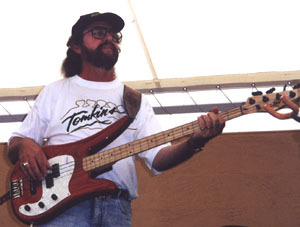 With years of experience to call on, Rob Brown knows what he's doing with his Tomkins bass in his hands. A veteran of many bands, Rob also won a Golden Guitar in 1975 for his recording Beautiful World. As well as his busy playing schedule, he is also the organiser of the TIARAs (Tamworth Independent Artist Recognition Awards).